My career as a writer was preceded by a (more successful) career as a drinker and a (considerably less successful) stab at gambling. That lack of success increased exponentially when I combined the two. I’ve often wondered if there was a correlation. But I digress. The point is, is that during those earlier incarnations I first encountered the work of Alan Sillitoe. I’d been hammered mercilessly in a brutal game of three-card brag, in a dive, somewhere on the outskirts of Nottingham. For those who don’t know the game, imagine, if you will, cards as close-quarter combat. This would make poker the graceful pinnacle of Shaolin Kung Fu and three card brag a pub brawl. With broken bottles and sawn-off pool cues. Especially if you play the insane can’t-see-a-blindman rule. But again, you’ll notice, I digress. I’d suffered the bad beat from hell. Three aces running into a prile of threes. You’ll play your entire life and never even see one of those hands, never mind two, head-to-head, in the same game. Rigged? Aye, it crossed my mind. Anyway, the aftermath of that sorry event saw me swaying under the impact of much whisky, in front of the piss-trough, ineffectually fumbling and scrabbling for my tackle. During my exertions I closed one eye and attempted to focus on the graffiti, virtually filling the entire wall above the urinal. “All I’m out for is a good time – all the rest is propaganda” was the message that caught my eye. It was signed A. Seaton. So now you know. That was the start. Aged sixteen, in 1983, still smarting, five years down the line from our overnight flit from Alloa in Scotland to Nottinghamshire in England. Maybe it was the way Sillitoe made the Nottinghamshire towns important characters in their own right that chimed with my teenage angst; resentful, alienated and exiled, trying to make sense of this strange land in which I was a stranger. Sillitoe gave me a map; of the places, the people, their characters and the things that shaped them. It was the start of my peace with Nottinghamshire and, eventually, my love affair with that most contradictory of places. Literary giants sharing their history with working class heroes like the tiny band of striking Notts miners who braved scorn and brutality. Their opposite numbers who sold their children’s birthright for the hollow promises of Tory ministers and the class enemy’s shilling. The pitiless drug dealers and gunmen that saw ‘Scab City’ renamed ‘Shottingham.’ Aye, if it’s contrast, diversity and opposites you want, Nottingham has them in abundance. 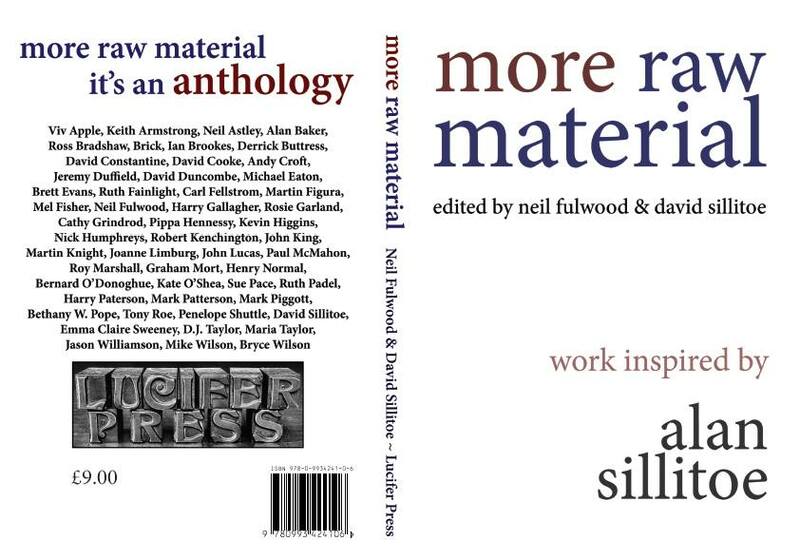 Yes, Alan and I go back a long way and so it was with great pride I accepted the invitation of co-editors Neil Fullwood and Alan’s son, David, to contribute to More Raw Material: Work Inspired By Alan Sillitoe. Like most writers, I have The Stuff That I Do and…other stuff. Stuff that never sees the light of day. My usual gig of music journalism and political commentary seemed a poor fit for the book. And I’d always laboured under an inferiority complex anyway. Oh sure, non-fiction – which is what pays my bills – is noble and intellectual and valid. But as someone who constantly battles my inner reader to pipe down and let my outer writer get on with the job of keeping a roof over my family’s head, I’d always held the sneaking suspicion that fiction writers, novelists, poets (like Neil), people who told stories, were proper writers. So I had a go and sent it in. A short story. Not brilliant, but, I believe, one that does chime nicely with the spirits of More Raw Material and of David’s father. I’d never deny the influence of Alan and where better than in such a volume to let that influence take me where it may? So I did. It’s a marvellous volume. Rich, diverse and eclectic. It contains photography, illustrations, poetry, travelogue, memoir, short fiction and much else. It’s a fitting tribute to a writer who knew no limits to his art and whose work covered all the above and more. At the launch of the book, hosted by Five Leaves Bookshop, I was asked to read my contribution and it was an honour and a privilege. A full house enjoyed readings from talented poets Maria Taylor, Harry Gallagher and Henry Normal, non-fiction from Robert Kenchington and more. David concluded the evening in a moving tribute to his late father by reading a selection of his most powerful poems.